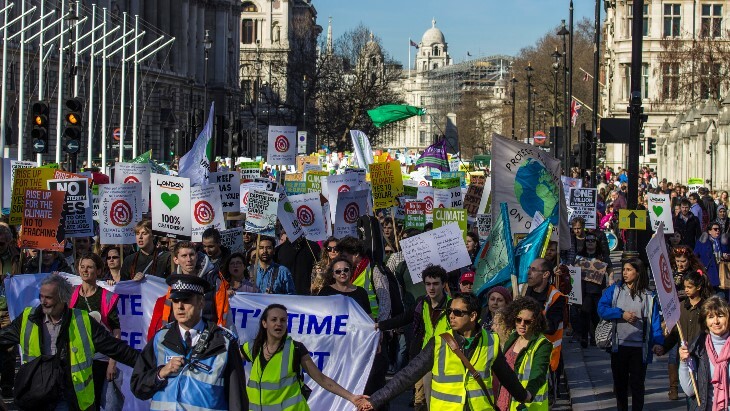 'Time to Act' was initiated by the Campaign against Climate Change to bring people together to campaign for urgent action climate change in the UK and towards the UN climate talks in Paris - and beyond! We want to engage people who may not have been involved in climate campaigning in the past, connecting with each other in local meetings and in mass demonstrations. Our grassroots Time to Act demonstration on March 7th 2015 brought 20,000 onto the streets of London, then in a wider coalition, we helped organise the People's March for Climate, Justice and Jobs on 29 November 2016, and joined actions at the Paris climate talks with activists from Europe and beyond. We are calling for the government to act on climate change. Not just to do something – to do enough to avoid climate chaos. This means investment not in new fossil fuels but in renewables – massive amounts. It means saving energy by insulating and converting all homes and all public and private buildings, and a shift from cars to public transport. It means a dedicated workforce to create this infrastructure – one million climate jobs. And it means the UK supporting a global agreement to cut warming emissions of all kinds, speedily, with fairness and justice. The demonstration on March 7th - two months before the general election, and nine months before the COP 21 climate talks in Paris - aimed to put pressure on political parties and raise the profile of climate change. On the day, over 20,000 people took to the streets of London to demand bold action on climate change. Jointly organised by the Campaign Against Climate Change and a dedicated team of amazing volunteers, Time To Act featured a rally which included a range of speakers but also encouraged the theme of the day to go beyond words, into actions. Dancing polar bears reclaimed the space at at Heathrow, banners were dropped at Trafalgar Square and off Westminster Bridge, the Tate was challenged by Art Not Oil for it's BP sponsorship and a giant carbon bubble was returned to the Shell HQ. During the march itself Occupy Democracy and Reclaim The Power orchestrated the largest ever recorded climate sit-down. The march showed we’re moving forwards. Among the 20,000+ people that marched, there were young Muslims, students, families, old-school green groups, churches, anarchists, trade unions, and so many others, walking together, demonstrating the amazing diversity of the climate movement.